Burnt hard by a bug that exists in a place that makes plenty of sense when you find it but not so much when you’re looking at the symptoms. 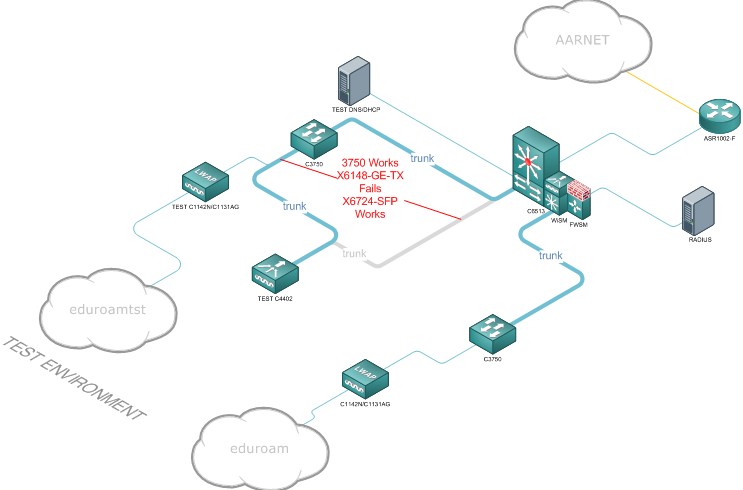 I was tasked with establishing an EduRoam presence at a University. 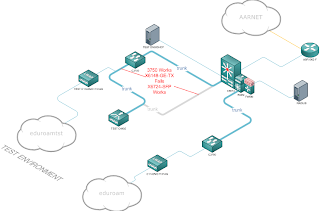 Since there was already a suitable wireless infrastructure in place all I needed to do was build a FreeRADIUS server, hook it into the EduRoam federated RADIUS and point the two Cisco 4404 controllers dressed as a WiSM (Wireless Services Module) at it so they authenticate EduRoam clients. Easy! Getting FreeRADIUS communicating nicely with EduRoam was made more difficult than it needed to be. The configuration information provided from EduRoam was sketchy and inaccurate. It wasn’t until I decided to chuck it out and build the FreeRADIUS configuration from scratch that it worked. EduRoam have some strange ideas on what should be sent on the outer TLS tunnel... it’s the inner tunnel that’s important, the other is just establishing an anonymous TLS connection to the local RADIUS server which will then pass the inner-tunnel to their home campus RADIUS. Okay, that was a bit tedious however that should be the hard part over with. Authentication was working nicely with the local LDAP directory (Novell eDirectory) and with other federated entities, tested with accounts from James Cook University, AARNET and the Australian Catholic University. Just the simple task of setting up a WLAN on the WiSM and confirming that it works with EduRoam as I had been using my trusty Mikrotik RouterBoard RB433 for testing. Associate a laptop to the new wlan, go to open google and was presented with a rather slow web experience that would basically stall on the first image that tried to load. However pings were fine so end to end connectivity was all there. Odd. Maybe I left something out/in or perhaps the RADIUS was setting some kind of QoS value on the controllers that I wasn’t aware of. Checked all that out, nope all good. Maybe it’s the laptop? Try a little netbook running Jolicloud - works fine. Okay, lets check with another laptop - win7 - fail! Macbook - works! A Windows wireless client + WiSM + EduRoam problem?? Hang on, lets try the Intranet, works! Lets try a proxy server, works! This is getting annoying, so it’s a Windows wireless client + WiSM + EduRoam + FWSM/NAT + Internet problem?? The next 8 months consisted of running every conceivable check on the data path between a Windows wireless client and the Internet. The Cisco TAC had crawled over the WiSM - all good, the FWSM, hmm old untrusted software, install another one! test again - all good, even the ASR - nope, all good. So I figured that it must be something I’m just not doing right. I blew away my test environment which consisted of a C4402 wifi controller and C1131AG/C1142N LWAPs, and the second FWSM running the latest software and rebuilt it. However when I did this I had physically relocated all the kit (except FWSM of course) from the data centre to the foyer just outside. In doing this I had disconnected the C4402 from the C6513 and plugged it into a C3750 I had set up for the link between the APs and controller and the trunk back into the general network. This configuration worked! So what did introducing a C3750 or simply moving it elsewhere on the network do to fix the issue? This made me think there was something suss going on with the chassis and/or connecting switching modules. By now the TAC had grown tired of my pokes and prods so I gave our Cisco account manager a nudge and the SR was escalated and an e-mail that was CC’d to ‘Cisco Australia’ popped into my inbox from the Cisco Switching team asking for a webex session so they could waterboard the 6513 chassis that housed the WiSM and FWSM. The phone call started at 10am Monday morning and didn’t end until 3pm. We worked through each stage of the data path again. Luckily they had the history of all the other tests I had done so I didn’t have to do many of the captures again. We narrowed down to the X6148V-GE-TX switching module. This was the one element that shared something in common with all the different combinations I had tried. The C4402 test controller was connected to it along with the link to the ASR/Internet. So I connected the C4402 to a port on the module (issue present, not working), ran a capture. Then moved the C4402 to a X6724-SFP module (no issue pressent, working) and ran another capture. Then the TAC guys ran a comparison between the two caps. It seems the X6148 was silently dropping packets, small ones, particularly ACKs from the client - egress to the ASR/Internet. Since there was no workaround the only option was to shift the ASR/Internet link from the X6148 to a X6724. Fixed! I plan to remove the X6148V-GE-TX from the chassis anyway along with a CSM. These are both ‘classic’ modules that don’t use “fabric switching” (2 x 20Gb dedicated) but instead use an older “bus” method (32Gb shared) thus causing the chassis as a whole to not run as well as it could. However if X61xx modules were all I had then I would be in a pickle. Wondering why this only affected Windows clients? So am I.
ACKs aren't all the same 'size' given the comparisons between pcaps I've grabbed from public repos. However ACK frames during a HTTP transfer all seem to be 60bytes long no matter the OS. I think it could be related to the differences between the Slow Start/Congestion Avoidance algorithms. The ACKs are probably being dropped no matter which OS is sending them, however some OSs might be better at recovering. Something to test. Although this problem shows indiscriminate dropping of 60byte frames so how can they recover?? I haven't been able to find a decent comparison between *nix/BSD/MacOS and Win* TCP stacks. It would be an interesting test to get a Linux box running the same algorithms as a Windows box. When I pull the X6148 out I'll toss it into the test 6509 and hang a test webserver off of it.